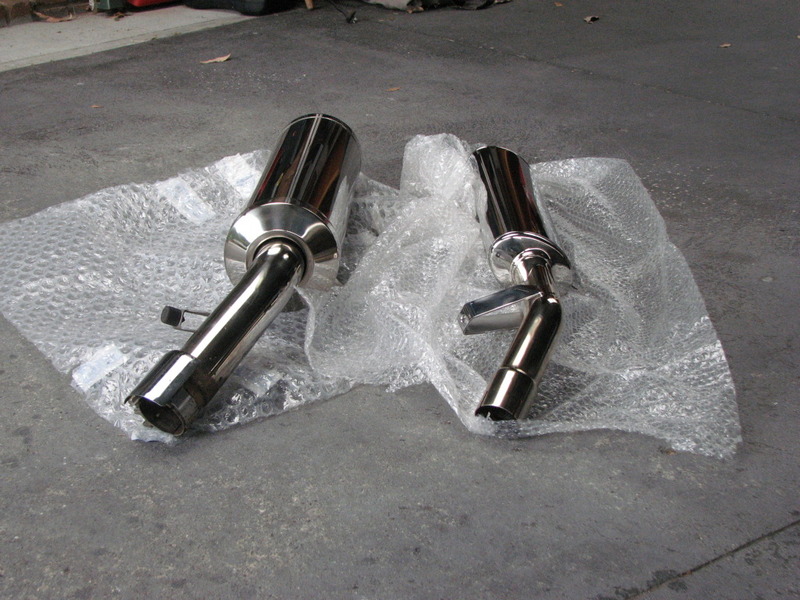 Thanks to Fossil I now have a Staintune exhaust. As you can see here the Staintune although similar in length to the stock can it is significantly smaller in diameter, and much lighter. Funnily enough when I enquired at my Suzuki dealer they told me Staintune list a different part number for the GSX compared to the GSF I can't see why. Looks good. Keep it shiny. Take the baffle out. And never look for it again. The End. @Hammy wrote: Take the baffle out. And never look for it again. The End. There's not really much left of the baffle. Fossil modified it. Only the very end of it left which just makes the exit hole smaller. Testing with it in and out there was no noticeable difference in sound. I prefer the look with it in. When I next go for a ride I'll be taking it out to see what its sounds like on the road. OK, so it's just sorta a looks thing. I still like the look " without ". I have the same can and the insert has never been in. Personal thing. The things I like about Staintune are: Aussie made, Tailor made, Good grade stainless, Fully welded ( no rivets or screws to vibrate loose ) . How do you like the note ? @Hammy wrote: OK, so it's just sorta a looks thing. I still like the look " without ". I have the same can and the insert has never been in. Personal thing. The things I like about Staintune are: Aussie made, Tailor made, Good grade stainless, Fully welded ( no rivets or screws to vibrate loose ) . How do you like the note ? Better a deeper note, would have like it a little throatier but as I haven't taken it for a ride yet the jury is still out. Took the baffle out and rode to work last night. Love it Bike now sounds like a bike and not a Suzuki Swift. What's left of the baffle wont be going back in. 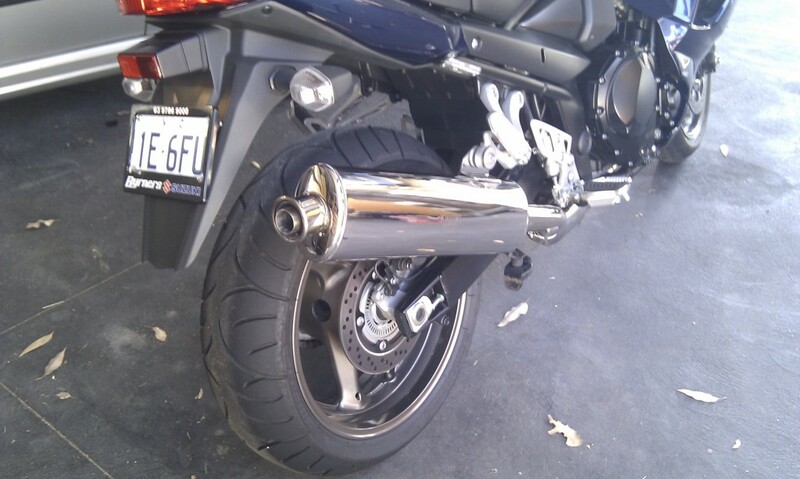 A mate of mine has a screaming demon on his GSX750F with out the baffle that thing is seriously loud! it basically becomes a straight through pipe. Real cop bait. You sound like One happy biker Max. The weight saving is huge. You will get a very slight HP improvment. And yes! The sound. Ahhhhh. I'm glad you're happy with the Staintune - according to their website the Staintune is 90dba without the restrictor which is quieter than some stock systems ( on other bikes ). I thought you might end up ditching the restrictor - I'm surprised I didn't bin it when I took it out. Yeah mate very happy with it, looks and sounds much better. The only reason I took the restrictor out was it rattles with it in and being as it makes no real difference to the sound apart from the rattle I decided to remove it. I did prefer the look of it with the resrtictor in, instead of a gaping hole that looks like something is missing, but that's not really something worth worrying about.